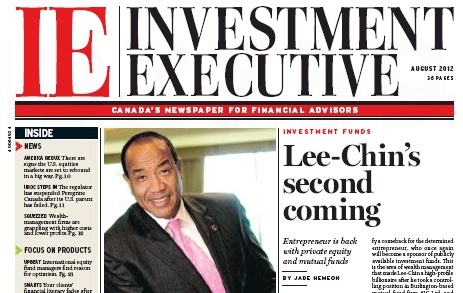 With the imminent launch of a new family of investment funds, Michael Lee-Chin, executive chairman of Portland Investment Counsel Inc. of Burlington, Ont., will be bringing private-equity investments to retail investors. The Portland funds may signify a comeback for the determined entrepreneur, who once again will become a sponsor of publicly available investment funds. This is the area of wealth management that made Lee-Chin a high-profile billionaire after he took a controlling position in Burlington-based mutual fund firm AIC Ltd. and built it into a sector giant. AIC’s fortunes eventually foundered on the shoals of disappointing performance – assets under management (AUM) fell to $3.8 billion from a peak of about $15 billion in 2002 – before the firm was sold to Toronto-based Manulife Financial Corp. three years ago. However, Lee-Chin’s personal portfolio has been bolstered in recent years by his holdings in private companies – and it is this kind of diversification that he wants to add to the toolkits of ordinary investors. Expected to be available on Oct. 1, the new Portland fund lineup will include three private equity funds and three traditional mutual funds. The mutual funds, including two equity funds and one income fund, will seek to own concentrated portfolios of superior businesses for the long term, similar to the strategy employed at AIC. Minimum investment for the mutual funds will be $250. On the private-equity side, instead of focusing on publicly traded securities, the new Portland funds will take stakes in private businesses spanning the spectrum of industries, including oil and gas, telecommunications, real estate, power plants, shipping ports and airports. With private companies, valuations are not subject to the same volatile swings as those for companies whose shares are traded in public markets. The private-equity funds will be sold by offering memorandum rather than prospectus, narrowing the target audience to accredited investors. Minimum investment for those funds will be $10,000. Lee-Chin says wealth is created most efficiently by private businesses, when the owner is “chief bottle washer and has skin in the game.” Private firms often are managed by strong, visionary leaders who have primary control over the firm’s direction and strategy, he says. As private companies are not priced every day in the stock market and management decisions aren’t inhibited by stock analysts’ reactions to quarterly results, business owners are able to focus on long-term strategies. When there is a team of people running a business, decisions require more compromises, Lee-Chin says, referring to the hired management teams and boards of directors who set the course for many large public companies. These people usually are compensated whether they make good business decisions or not, he says. However, the fact there is no daily public market for the shares of private businesses means that the assets in the private-equity funds are not liquid. Value of the holdings in the Portland funds will be realized ultimately through a liquidity event, Lee-Chin says, such as the sale of the company, a refinancing through debt or equity, or a public listing. The launch of Lee-Chin’s new venture may mark another turning point in the dramatic career of the self-made billionaire. After his beginnings as a mutual fund salesman at Toronto-based Regal Capital Planners Ltd. and Winnipeg-based Investors Group Inc., Lee-Chin recognized the profit opportunities in owning and managing the products he was selling, so he bought AIC in 1987 as the vehicle to launch a family of funds and receive lucrative management fees on the assets. At the time, AIC was a fledgling money-management firm with less than $1 million in AUM. Using Warren Buffett’s long-term “buy and hold” philosophy and concentrating heavily in wealth-management and financial services companies, AIC then rode a wave of strong performance for more than a decade as assets flowed into the funds. By 2002, AUM had surged to $15.4 billion and Lee-Chin had amassed a personal fortune estimated at more than $2 billion. After the sale of AIC, Lee-Chin and his team at Portland continued to subadvise on a handful of former AIC funds under their new banners at Manulife, but that contract recently ended. Some financial services industry-watchers say Lee-Chin faces an uphill battle on a number of fronts. First, he must overcome the damage inflicted by several years of lacklustre performance by the AIC funds and win back the loyalty of dissatisfied financial advisors and clients who redeemed funds. Second, industry dynamics have changed, with investors increasingly risk-averse and conservative in their approach – particularly baby boomers approaching retirement. With markets volatile and investors fearful, wealth-management companies are fighting harder for sales. Lee-Chin says the advantages of private equity became “crystal clear” to him during the financial crisis of 2008. Although his publicly traded holdings were hurt by the market meltdown, he continued to do well on his private-equity projects. The National Commercial Bank Jamaica Ltd., in which he took a 75% position in 2002, has seen its after-tax earnings rise from $5 million a year to $150 million in 2011. The bank is now ranked first in the Caribbean, Central and South America, he says, and 14th in the world, in terms of return on capital. Lee-Chin has also done well with a minority interest in Columbus International Inc., a leading provider of cable and broadband services in Latin America and the Caribbean that he bought in 2006. “Private equity may lean more into Michael Lee-Chin’s strengths than anything else he’s ever done at the retail level,” says Dan Hallett, vice president and director of asset management at HighView Financial Group in Oakville, Ont. As for today’s more fearful and conservative investor, Lee-Chin believes there is a lot of frustration and fatigue associated with exposure to public markets, and that advisors and their clients will be receptive to the benefits of private equity. When introduced into the mix, he says, private equity will lessen volatility; the new Portland products will help advisors differentiate themselves and give them something new and useful for their clients in a tough market.